North-east of Bombay, near Aurangabad are two astonishing series of temples carved out of living rock over the course of fourteen centuries. During the 4th century AD. in a remote valley, work began on the Ajanta caves to create a complex of Buddhist monasteries and prayer halls. As centuries passed, numerous Buddhist monks and artisans excavated a set of twenty-nine caves, some cells, monasteries and Buddhist temples. All of these were carved from the rock cliff at Ajanta. These caves are adorned with elaborate sculptures and paintings which have withstood the ravages of time. The sculptures are finely wrought images of animals, guards and deities while the paintings tell ancient tales of courtly life and depict hundreds of Buddhist legends. Amid the beautiful images and paintings are sculptures of Buddha, calm and serene in contemplation. 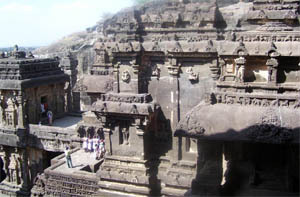 Work started on the Ellora caves in the seventh century AD where another set of caves were created from living rock. Buddhism, Jainism and Hinduism inspired these sculptors to create these elaborate rock carvings. The Buddhist and Jain caves here are ornately carved yet seem quiet and meditative whereas the Hindu caves are filled with a divine energy and power.